Runners and throwers combines fielding and striking. Finding space is a key challenge for the batter. 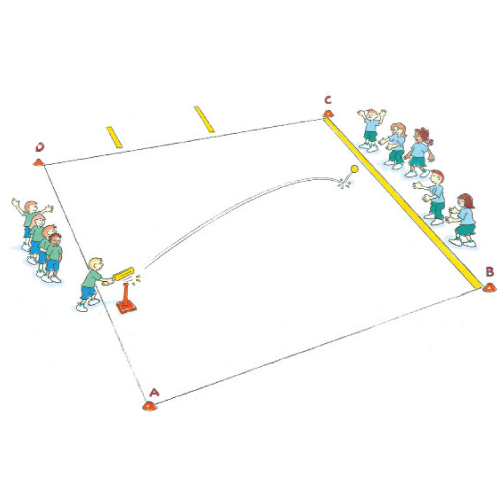 Activity levels are increased in a fun way for both the batters and fielders. Divide your players into 1 fielding team and 1 batting team. Place the fielding team in a line along a marked diamond. The batting team hits a ball off the tee to the fielders’ line. the batter drops the bat an runs from the tee to marker ‘A’. Once the ball is fielded, the fielding team must get the ball to marker ‘B’ then pass to each player down the line to marker ‘C’. The batter only stops running when the ball is placed on the ground at the end of the throwing line at marker ‘C’. Where should you hit the ball to give your team the best chance of running around the markers?